The software's version 1.0 is stable for download and use. The software has been tested on Suse 9.1/9.2, RedHat 7.3 and Rocks 3.2. 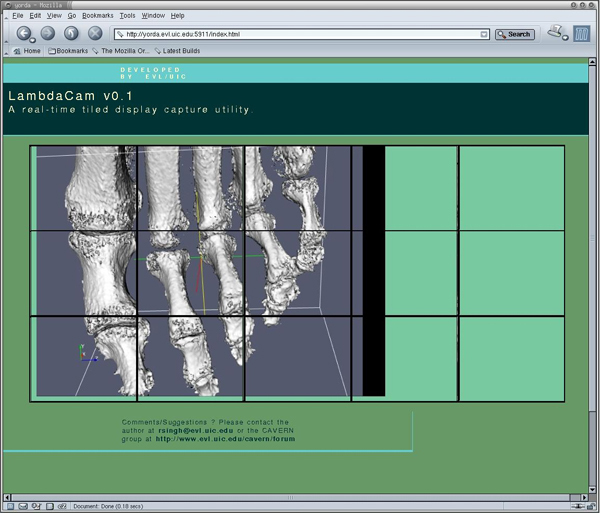 The OpenGL based viewer program has also been tested on MacOS X. Figure 1 shows a snapshot of a web-browser displaying EVL's 5x3 tiled display. Though the actual dimensions of the tiled-display are 6400 x 3072 pixels, LambdaCam scales the output to a 1024 x 491 pixel image.